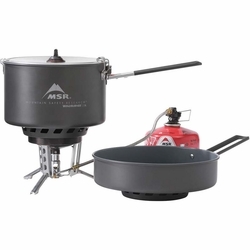 MSR WindBurner Combo Stove System. Windproof, modular stove system for cooking real food and group meals. This stove system combines the ultra-efficient performance of WindBurner® stove technology with the ultimate tools for backcountry cooking. Featuring a ceramic-coated 2.5 L sauce pot and an 8” skillet, this modular stove system offers simmering and cooking versatility for small groups, and full compatibility with all WindBurner cookware. The stove’s windproof radiant burner and pressure regulator maintain its performance in all conditions, whether you’re cold-weather camping with friends, or cooking a gourmet meal on a windy beach or mountain slope. The stove system nests all components for easy, efficient packing. Experience the WindBurner Stove System Collection.